In conjunction with our acquisition of First's depots in Plymouth and South Devon, we will be launching a new network under the Stagecoach brand to replace many of First's services. 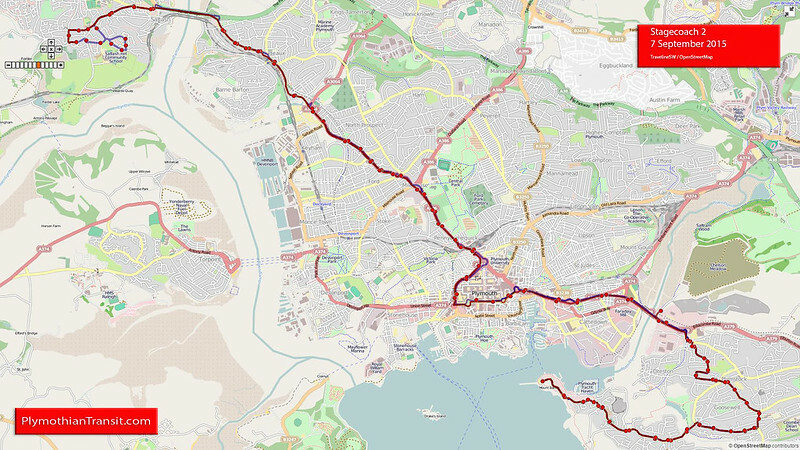 The changes include some new route numbers, more reliable timetables, improved frequencies and regrettably also some reductions to make the network more sustainable for the future. Plus our existing routes X38 to Buckfastleigh and Exeter and Stagecoach Gold to Ivybridge, Totnes and Torquay continue with minor amendments. Other local bus operators already provide services that match First's frequencies over most of these areas and, in conjunction with the City Council, are arranging alternatives for the areas that they don't. Please visit www.travelinesw.com for more information. A direct route 101 between Plymouth and Derriford Hospital via Milehouse will run every 10 minutes Monday - Friday peak periods (see below). Oreston will no longer be served. Route 2 will serve Pomphlett Close as now, whilst new route 2A will serve Pomphlett Road and Dene Cross Road. In partnership with Devon County Council an all year Sunday service between Dartmouth and Kingsbridge is introduced in place of the current Summer-only service which was due to finish on 20 September. There are no changes to the route or timetable for this service, which is provided in partnership with Devon County Council. The summer Sunday service ends for this year after 13 September, and so is not included in our timetable. The service will run as advertised by First on 6th and 13th September 2015. An amended service will run from 26 March 2016 in partnership with Plymouth City Council. There are no changes to the existing route or timetable. 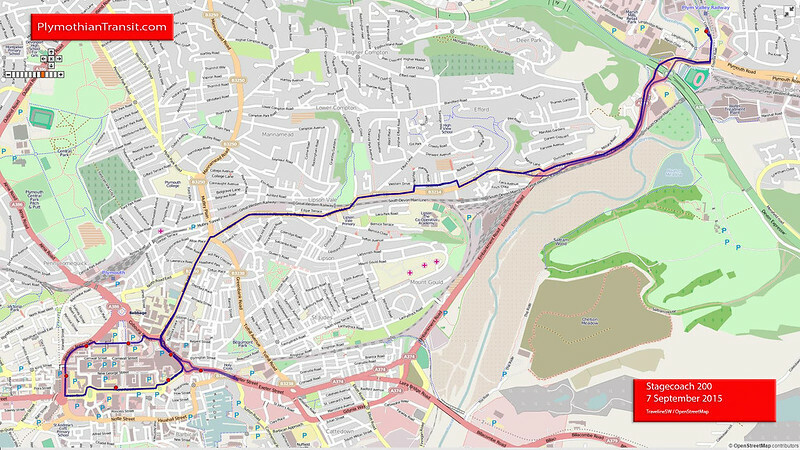 The 90B via Archway Drive will be retained on a trial basis following the withdrawal of funding by Devon County Council from 20 September. We will be running services from the George Junction (near Woolwell), Milehouse (at Plymouth Argyle football ground) and Coypool (near Marsh Mills roundabout) Park & Ride sites from 7 September 2015. Plymouth's Park & Ride services are the easiest way to get into the City Centre. Buses run up to every 10 minutes at peak times. Simply park, hop on and go. No expensive parking to worry about and our priority bus lanes will get you there quickly and easily.This replaces route PR1 with buses running up to every 10-12 minutes as now Buses returning from Plymouth in the morning, and back in the evening will be renumbered 101 serving Derriford Hospital and all stops along the route The existing First Park & Ride buses will continue to be used until early 2016. If you miss the last 100 Park & Ride bus to the George Junction just catch a Stagecoach route 1 or X1 bus which stops just across the road outside the George Pub. You can also catch Stagecoach route 2/2A to Milehouse Park and Ride. These buses will drop you a short walk away, just across the road on Alma Road (opposite the Life Centre carpark). Your Park & Ride ticket will be valid on these services. The 200 was previously known as the PR2. I have just noticed that the Traveline map shows a different route to the current PR2. Whilst this may be correct and indeed might be a good choice as possibly slightly quicker than the current PR 2 route at times I am not convinced! There is nothing anywhere to suggest a route change but then as there are no stops there is no reason why this couldn't be correct either! These will be covered in a future post as there are a couple of changes made by First a week before Stagecoach take over! Five Plymouth bus routes are to be withdrawn as Stagecoach takes over services across the city from First. Stagecoach says the routes are already well covered by other services. The changes will come into effect from September 6. The network will also see new route numbers for some services. Bob Dennison, Managing Director of Stagecoach South West, said: "We're really excited to be launching our Plymouth and South Devon network which is built on frequent services, good value fares, modern buses and easy to use timetables. We have a lot planned for the next few months so please bear with us whilst we get everything up to speed". Stagecoach will offer a similar range of tickets as First, with unlimited weekly travel starting from £11. All existing First season tickets will be accepted by Stagecoach until their expiry date. Season ticket holders from areas that Stagecoach will not be serving should contact First for a refund on the remaining portion of their tickets. Note the comment about First still running the Sunday 48 for the last two weeks of the summer season on 6 and 13 Sept. From what I can tell on Traveline this also applies to the 187 which is not due to return next summer. I wonder how / from where First will run these Sunday routes on these two dates ? Thats not how I read it! They SC are running the service as previously advertised by First. ie SC are just using the old First timetable for these two Sundays. SC have just left the Sunday operation out of their published new timetable. 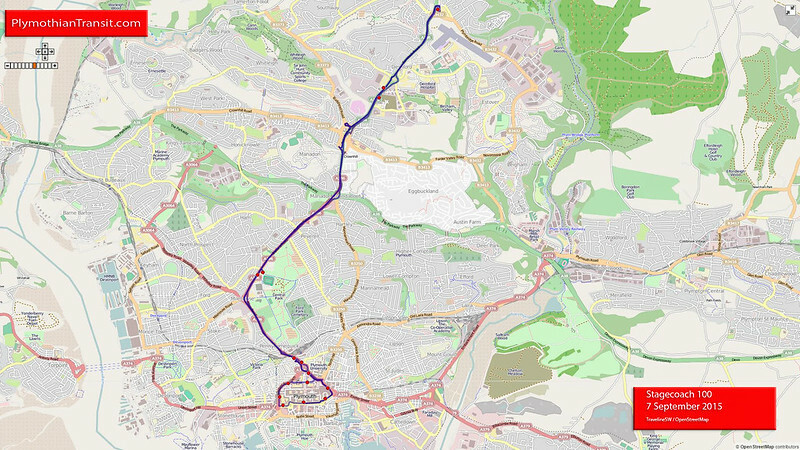 Looking at the map, the 200 Coypool P&R traces almost the exact route of the 'Purple 6'; with the exception of Efford and the slight extension from Marsh Mills roundabout on into Coypool. 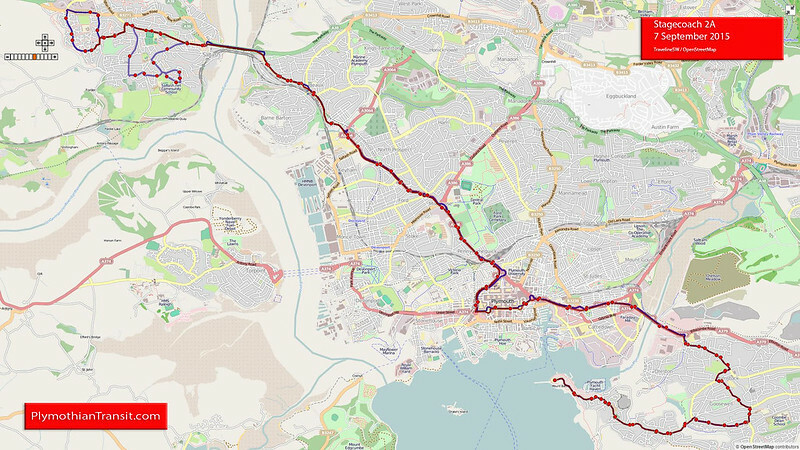 Routing the 200 through Laira and Lipson probably makes sense (if the map is correct), considering the 6 is ending. So that means SC will still be running a frequent service along that corridor, which I believe has proven quite lucrative for First. Only Efford looses out with this change, but that's still well served by PCB. This new 200 service could prove to be very convenient for the University if it takes in North Hill. As a user of the Stagecoach version of Trapeze (their computer based scheduling and mapping package), I can say categorically that it doesn't select the route for you. 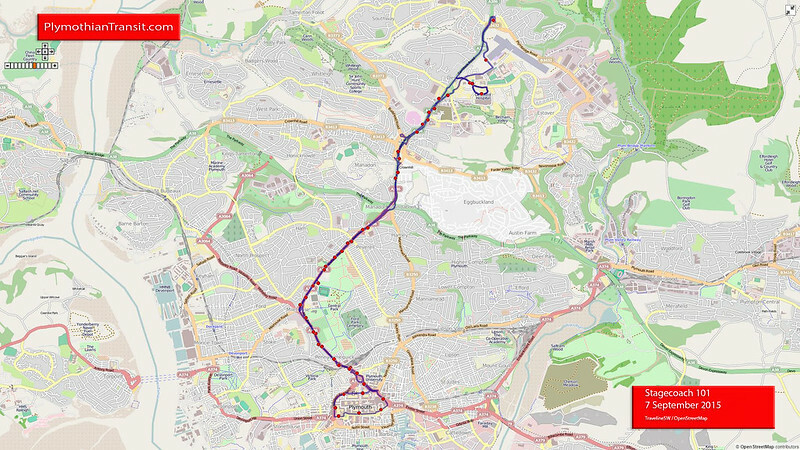 If the route was plotted incorrectly it would have been a simple human error or lack of local knowledge. Normally, if you use roads which have existing bus stops shown you can't go too far wrong, but in this case someone may have done . . .
Why are Stagecoach using First buses on both P & R services until early 2016? Lack of quality buses within SC? Mind you, some of the buses used on the P & R services are pretty poor. I guess its down to having to find so many buses from within the group in a very short timescale. As most of the buses involved are branded for the P&R it makes sense to keep them on until suitable replacements can be found, or more likely purchased new in the new year. Surely the Council hasn't contributed to the cost of doing up First's buses? It's a commercial service operated by a large PLC, so why is the Council throwing around cash like this when it doesn't need to? (to Anon. 17.34) I believe Devon County Council contributed to painting buses for the 93 in 'Mayflower Link' livery and also to the purple 'Tavy Lynx' for Tavistock. I believe Cornwall Council may have contributed to the cost of the mauve livery for the Torpoint buses, too. In my view this was not money well spent as First have a long history of inability to put route-branded buses where they belong. They will say that this was to cover breakdowns - but there was too much of it for that. The excuse wore particularly thin when I saw the ferry-liveried buses in Plymouth on a private hire and old step-entrance vehicles providing the service to Torpoint. Keith - you appear to be a bit confused. IIRC both the Torpoint and Tavistock examples were part of Kickstart. Basically, a partnership between councils and operator to improve the sustainability of bus services with central government funding (administered by the local authority) to help pump priming. The operator also makes a financial contribution as part of the bid. There were covenants to ensure that the fleet remained allocated to those routes though those expired some time ago. The livery was a conscious decision to improve the profile. Elsewhere, where Stagecoach won Kickstart for Culm Valley Connect, standard livery was the choice. There are already joint day tickets between Citybus and Stagecoach, which may be revised and/or clarified and there are new fares promised. Dartmouth - already in Torbay fare zone and there are day and weekly tickets for Torbay + Dart Ferry. In any major upheaval of bus services there will always be a small minority who will be worse off. There will also be those who benefit. I am personally looking forward to using the 3 from Dartmouth to Plymouth with my £7.50 Stagecoach Explorer ticket, as part of a scenic alternative route to the Gold from Torquay. I don't know what you expect the Council to do, as usually they do not get involved in the fares and ticketing policies of privately-owned bus companies operating commercial services. having looked at the upcoming timetables it appears Plymouth city is losing about 20%off its services between 30 august and 21 September so there may be more than a small minority that will be worse off,and if there is next to no compertion fares will increase for all, I suspect before xmas. If Stagecoach do not go for joint ticketing with Citybus, there is the Skipper ticket allows travel on any operator's service. Anon 19:54 - Stagecoach charge £3.60 for a day ticket in Exeter, a much smaller network than Plymouth for just 10p more you can travel in zone 1 and 2 in Plymouth for £3.70. SC are keeping the £3.00 First day ticket for Plymouth, with an even smaller network than First used to run. Get your facts straight, PCB will have a bigger network for proportionally less money. I would hope that a version of the Skipper ticket could be introduced as a weekly and monthly ticket to allow unlimited travel in Plymouth on any service. I suppose now is a good time to post what vehicles we know will be used for Plymouth, former Carlisle 37113-20, former Exeter 47084-90 plus I believe several Tridents from the Cheltenham area are expected (although at least 7 are coming up here to Liverpool as well, two arrived already...off topic for here though), can anyone add any more? Of course Citybus will put there fares up!! They are a business that need to make money?!?! They're hardly going to keep the £1:10 fare on the 8/9's are they? A daily user of psrk and ride. Comparison, First bus timekeeping poor, buses went missing, staff disinterested poorly managed. Stagecoach new buses, mostly run to timetable, same staff more professional. Enough said, goodbye Furst don't come hack.